Outside: cream painted weatherboard (later white) with coloured trim around windows etc (at times red/orangey/green) with small semi enclosed front verandah, large semi open back porch with a ramp from driveway, (this was later replaced with an outside open verandah and steps). From the front door there was a large entrance foyer with lounge and 1st bedroom off to sides, at the end of the foyer was the main hall, to the right at 2 more bedrooms, to the left bathroom and linen/coat cupboards, then through to living/dining room with kitchenette. As with No 6 Dad converted these rooms, taking out the wood stove and moving the large pantry cupboard into the new kitchenette. He also built in the semi open back porch which had the laundry/washhouse opening off it. A sewerage system was installed in the town in 1959/60 and the toilet was put in off the laundry. The floors of the house were wood with our own carpets and lino. The walls were painted pine panelling, with the same white and black criss-cross black straps as No 6, however over years the walls and ceilings were painted several times in up to date colours. 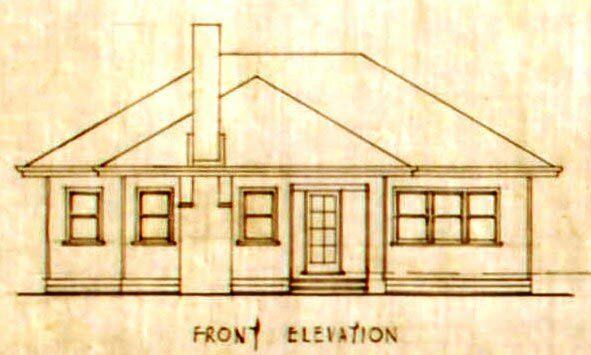 Flora wrote that the plan for No 4 Banksia is almost right but when they built houses in those days (as indeed they do now), they tweaked the same designs to make them look different. 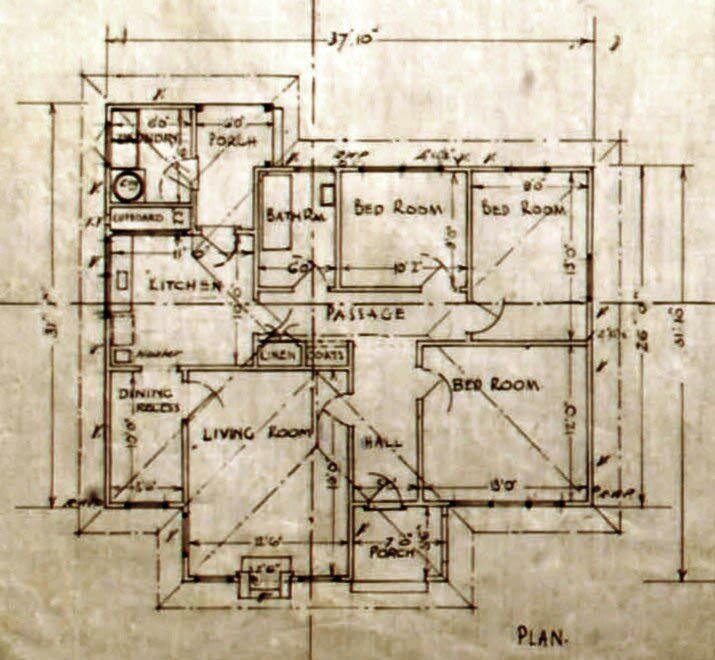 The design as printed is the same as No 8 (my friend Kathleen's house), however at No 4 there was NO door from the lounge room to the little room off the kitchen, and No 4s fireplace was on the wall next to the pantry (which Dad turned into a kitchenette) NOT at the front. Nos 6 and 8 and others down that way were built in the late 1920s and were black oiled weatherboards (quite hot in summer!) shaped like this J, ie.curved at the bottom, whereas No 4 and No 2 were "more modern" and built in the 30s and were cream painted weatherboards shaped like this L, ie straight at the bottom. That would appear to be when the design change took place. There was a place in Green Street where the Cullen's lived that was brick but was the same basic design as No 8 Banksia, just bigger. I attended Yallourn High school whilst at this house; went to Presbyterian Church; was in numerous concerts and choirs; was in Guides; went camping with friends; followed Yallourn Football Club; played tennis, netball, softball. Had a recurrence of my previous illness and had to spend some time in bed at home. I remember being late for school and running/riding bike up the steep path beside Strzelecki Road – what an effort. I worked at Yallourn Public Library between Jan 1954 and Jan 1957 and helped move from old site to new building across the square. I remember Saturday kids' matinees at the Theatre – a big social gathering. I remember all the new people that came from Britain and Europe after WWII, the new prefab houses at Newborough, the men thronging the shopping square on Saturday mornings, the kids from other countries in our classes at High School, and the people that Mum and Dad sponsored. Was involved in collecting money for the peoples share of the building of the new Olympic pool - SEC put in matching amount – this was opened in 1960. I moved to Darwin in Jan 1957 - got married and my RAAF husband was posted to Melbourne – Mum and Dad continued to live at No.4 and we came down every other weekend and holidays, especially when kids were at school so I kept up with the town. General Comments: Dad became foreman in charge of the town electrical workshop/maintenance, and an electrical inspector – at the shops, ladies would say hello to him and Mum would ask who they were “I don’t know, but they live at 27 Church Street”! The old fire station in the town square became Kernot Hall, and I remember the High School and Tech School students learning ballroom dancing there – great fun – we got to meet the boys, but after the library moved a new building was built and named Kernot Hall. I was banned from going anywhere near the hotel but as Dad did the refrigeration there I knew a lot about it, for example when they built the temporary bar into the park, the hotel had the highest sale of beer in Victoria for some considerable time. I remember the bus station/depot being built – have lived many places but not seen one as good. Nearby Neighbours: 8 - Cleverley; 10 - Sherri (left in 1960s); 12 - Mrs Boucher (left in 1960s); 14 - Grant (1960s); 3 - French; 5 - Oddy brothers; 7 ? ; 9 - Hamilton (1960s); 11 - Milne; 13 - English; 15 - Edwards; 1 Parkside - Seers; 3 Parkside - Padfield; 5 Parkside - Glen (moved to Newborough early 1970s); then an electrical linesman moved in. Mills family lived there before us; no-one after us.